The other day, I sorted through plant tags stuffed into a pot on the patio. (I don’t save every tag, or I’d need a pot the size of my house). I keep a running list of “dream plants.” Since this can mean something I scribbled on my hand, or a gazillion scraps of paper (some retrieved from the dryer), I’ve begun to type every brainstorm into a folder “Garden tasks,” easy to supplement on a whim from my computer’s taskbar. I was feeling so proud, until I found another LONG list stuffed into my garden diary. Type, type, type. And I added five more today. Yowsers! These days, I record acquisitions in Excel, noting date, nursery, and where I put it. If it’s a passalong, I note its sweet heritage. If a plant goes belly up, I note that, too. I used to do this with a pen, scrawling into my garden diary, and I still do some of that. But it’s much easier to find everything on my laptop. Sorting through the tags reminded me of failed experiments, annual delights (including ones I’d totally forgotten), and those I want to try again. Spreading their brittle testimony in my hands was a powerful connection to my garden journey, far more powerful than any computer document. Yet, I can thank my spreadsheet to remind me that it was 2009 that my neighbor seeded a butterfly vine (Mascagnia macroptera) for me. I planted it on my fence where he can see it from two yards away. Although I haven’t kept it watered as well as I should, it made it through these past hard years. It does attract butterflies, bees, and other pollinators. But it’s nicknamed for the dried seed pods that resemble butterflies. A few years ago, CTG’s director Ed Fuentes and KLRU colleague Mary Alice gave me some from their vigorous vines. I spray painted them in Christmas colors as gifts to a few friends. They’ve held up beautifully! Butterfly vine is one of the many drought-tough screening plants that Tom and Christine and Bill Reid from Reid’s Nursery explore this week on CTG. Christine & Bill know just what to do about every situation, since they are hands-on gardeners who guide their customers with personalized advice. For CTG, they brought a selection of vines and shrubs. Our eyes popped out with this cenizo! Another they brought along is Xylosma (Xylosma congestum). We ran out of time to talk about it, but this is a great screen for sun to part shade, growing about 15’ high x 10’ wide. Berries attract birds. It may be cold tender for some, but the Reids had no problems these past two chillers. (This week, I saw some planted at a butterfly library garden in Bulverde. They’re acting as wind breaks on the open hilltop site to slow down the wind whoosh for nectaring insects, and a place for them to seek shelter). Get Christine’s complete list and details for all the plants she and Bill brought to CTG. Reid’s Nursery is just 10 minutes east of I-35 between Kyle and San Marcos. Check them out for personal garden attention and their free workshops! Since varieties and cultivars can make a difference on a plant’s performance in tough times, this week Daphne explains the difference between the two. Essentially, a variety occurs naturally when a plant hybridizes with another in its genus and species. You’ll see the word “var” on a tag, like this one. Genus: Aquilegia Species: chrysantha Variety: hinckleyana. But these days, you can also see plant tags with the initials “c.v.” That indicates that the plant is a cultivar, which means that humans were involved in its creation. Per Daphne, “And just like other man-made items, companies want to protect their investment, so cultivars are patented, meaning that no other company can reproduce or sell that plant until the patent has expired.” You may see “Plant Propagation Prohibited” on some tags. Gardeners and insects may propagate the plants, but growers cannot! Very often, you’ll see cultivars with single quotation marks like Cenizo ‘Convent Sage’ (Leucophyllum frutescens) ‘Convent’. Daphne’s plant of the week, Euphorbia ‘Diamond Frost’, is an example of a trademarked cultivar, introduced by Proven Winners. Usually deer resistant, ‘Diamond Frost’ is an excellent low-growing, drought-tough plant for part shade. It blooms from the minute you plant it until first freeze. Some gardeners can overwinter it in protected microclimates, but outside of Zone 10 or 11, it is considered an annual. Mine does die in winter, but I’ve planted naturalizing bulbs around them. Since I’ve left the space, it’s easy to plop some more back in April, where they can flower with winecups to set off their foreground. But, as Daphne notes, this is where we must adapt the plant tag to grueling Central Texas sun. Although the tag says “Full sun to part shade, for us ‘Diamond Frost’ should be planted in bright, filtered light, or light shade. Morning sun is fine. Until this summer from you-know-where, mine were actually fine with late afternoon low shafts deflected by a mountain laurel. You’ll also see varieties and cultivars with naturalizing bulbs like Narcissus ‘Ziva’. This week, Trisha explains how and when to plant your naturalizing bulbs. She’s also got tips for chilling the specialty bulbs and ones we want to force for the holidays. Augie doggie’s Pet of the Week is Pierre, a Mini Pinscher, Chihuahua and Daschund mix. On tour, meet one of my new spiritual mentors, Claire Golden! 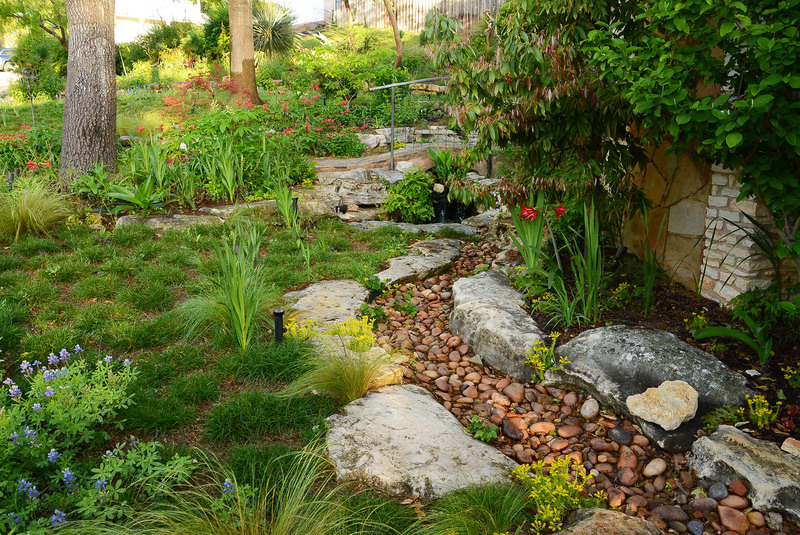 Long before she restored her 1920s bungalow in Alamo Heights, she was dirt-deep in plants. When she fell in love with this old house, she replaced grass in the old Spanish courtyard with stones and an acequia that unites its diverse levels. In front, she turned a drainage nightmare into a reflective (and party time) destination. Native Plant Week (Oct. 16-22). Get these tips to celebrate all year. The Native Plant Society of Texas symposium in Houston (Oct. 13-16), featuring talks and much more. And they’re playing Wildflowers|Seeds of History at the Saturday night banquet! The Lady Bird Johnson Wildflower Center’s fall sale on Oct. 15 -16 (member preview Oct. 14). The Lone Star Gourd Festival in Fredericksburg Oct. 14 -16.